Look What I Bought at My Goodwill Store! A vintage -looking sweater from Harold’s – 50 % off, I paid under $3. A Calvin Klein gray sleeveless sheath dress with soft, silky fabric for $14.99. This is a classic that looks great with a cardigan sweater. Two Tommy Bahama items- a navy dress with a leaf pattern for $19.99 and a retro looking blouse for $9.99 that I am wearing with white pants and sandals. I also scored a pair of Tory Burch black driving loafers for my sister that I paid $7.99 for! Have I convinced you yet that thrift store shopping is a treasure hunt? Tell me about your favorite thrift store score? Mine is an entire wardrobe of St John Knits. You can see my big score here! Savers has replaced Goodwill as our favorite thrift store. 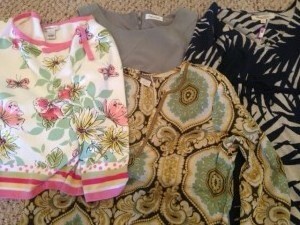 Over Memorial Day weekend, I used my Savers card and got 50% off all the clothing! I got a Tommy Bahama shirt for my husband for $15. I got a blouse with the Nordstrom tag still on ($54) for only $7.50! The stores are large, well organized and very clean. Locations: LaMirada, Riverside, Anaheim. On 2 Saturdays each month, the California Liquidators are open in Commerce. They have everything from “junk” to some Neiman Marcus items. There are lot of Merona brand items. These surpus items are bought from retail chains and sold at a bargain. Our best deal there was a Shark steam cleaner for $21! We’ve also gotten Noritake and Wedgewood bowls for just a few dollars. They are open the second Saturday and last Saturday of each month. You have to get there early for the best finds and it’s crowded, but worth it. I also love Savers Mary Jo. I have only been to the one in La Mirada and when I visit my sisters in Long Island, there is a Savers where I have scored amazing designer items. I did not know about California Liquidators- that sounds like a great Saturday activity for me. Yesterday my daughter was ready to spend over $150 for cowboy boots for line dancing and I found her the cutest pair of red boots at Goodwill for $9.99!